Low velocity headers are used to separate hydraulically the boilers from the rest of the system. 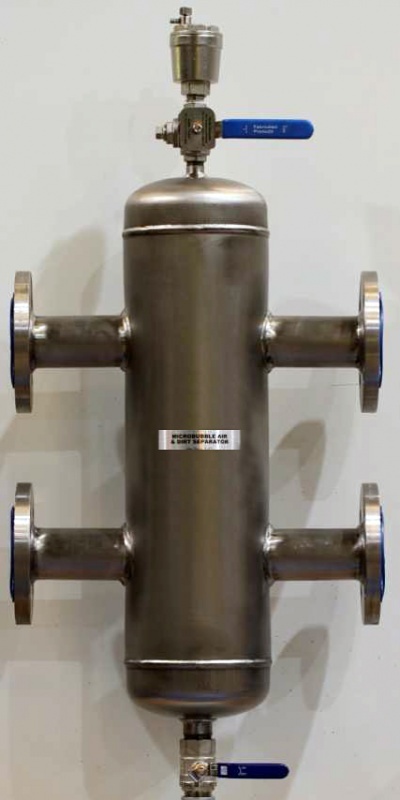 In addition to helping maintain a minimum flow through the boiler, they create a low velocity region for system dirt to be deposited and separation of air from the system water. Used in conjunction with a system filter, they are invaluable when connecting a new boiler to an existing system. Low velocity headers should always be vertical and sized for a maximum water velocity of 0.5 m/s. Low velocity headers are designed to ensure a water velocity of 0.2 m/s or less and for ΔT 10 or 20, so will be suitable for most systems. 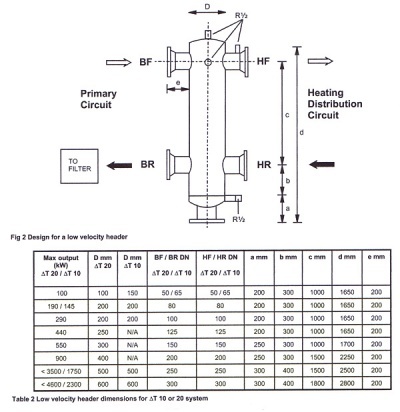 Fig 2 proposes dimensions for the design of a low velocity header, and Table 2 shows dimensions for a ΔT 10 or 20 system. (C) The full height internal stainless steel membrane to encourage air to rise and magnetite and dirt to fall. (F) We can add extra 1/2" BSP female tappings in the flow and return for instruments if required. (H) The magnetic probe in the return removes magnetite even at 5 microns and below. Most condensing boiler manufactures will advise the use of a filter in the return as close to the boiler as possible. Simplex and Duplex (as shown above) filters and other methods can prove to be very expensive however we can supply these as a total package. 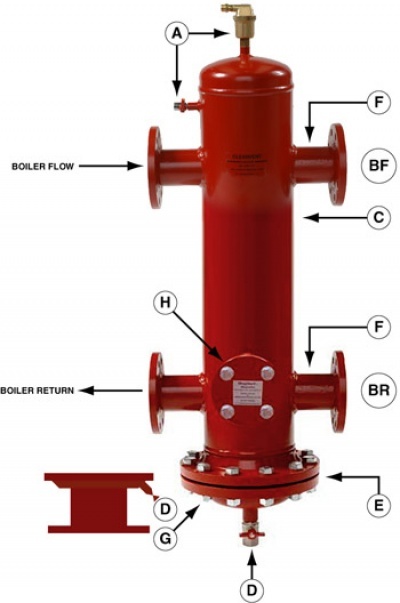 The magnetic probe must be periodically cleaned and maintained and with the flushing valve and particularly the removable base flange regular maintenance may possibly eliminate the need to install filters. 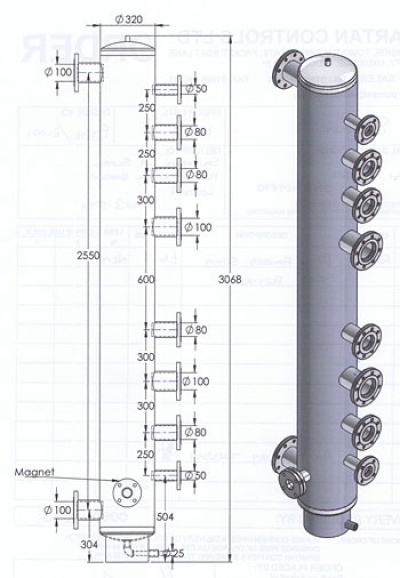 The Low Loss Header shown here is a Magnetic Bespoke Model designed with boiler F&R tappings and two sets of system F&R tappings. The principle behind the design saves separate horizontal boiler headers, no requirement for a separate magnetic microbubble air and dirt separator, the unit has an AAV at the top (Not Shown) and a flushing valve at the base. The Magnetic probe for Magnetite removal is contained in the base. The savings on valves and fittings by this method is significant. 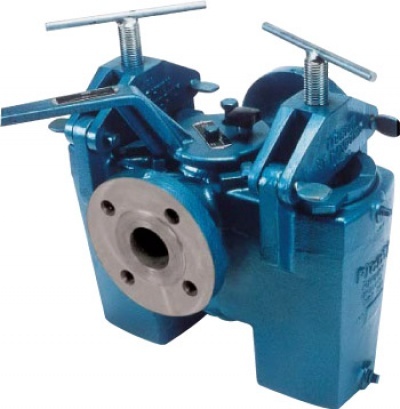 We can also add a base flange, if required, to make it into a removable/demountable version. Please consult us with your requirement. We can similarly do various bespoke fabrications on buffer vessels.